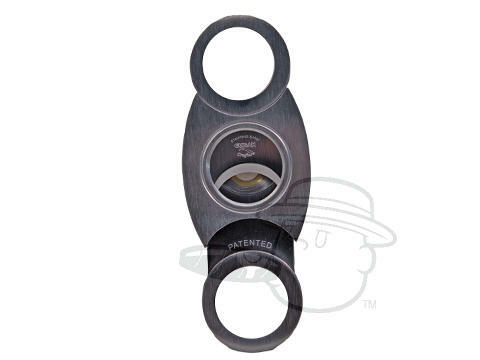 Solid and durable guillotine cigar cutter. This is a good solid dual-blade cutter. A good deal for $11.99. I bought this cutter a while ago and carry it with me everywhere I go. This is my favorite cutter(barring my tabletop cutter), because it's a quick, no brainer of a cut. It works perfectly for most cigars. The weight and feel denotes the excellent construction. The size and shape is perfect for people with small hands, such as myself. There are the rare occasions when I'm forced to re-cut a cigar, because the cut is too shallow, especially with the larger ring sizes. After 9 months of 2-3 daily cuts, the blades are still extremely sharp and cut cleanly. I highly recommend this cutter for novice smokers and people looking for a consistent cut and with the lifetime replacement guarantee from Cuban Crafters who could go wrong. Perfect for cigar newbie or expert alike. If anything, it may cut a little deeper than I like but that is an easy fix, and it will certainly stop you from taking the whole cap off and unraveling your cigar. Cuban Crafters Perfect Cutter #24 is rated 4.6 out of 5 based on 5 customer ratings. Is this stainless steel or plastic? This Cuban Crafters Perfect Cutter #24 is made with stainless steel and is a very solid cutter. Everyone seems to love it!